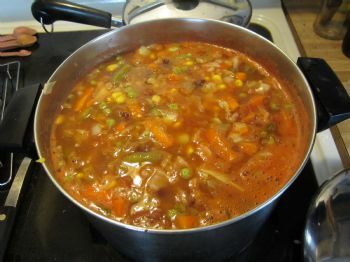 Vegetable soup (with some beans) is a warming and filling meal in the fall. I just wanted to remind everyone that you can save yourself a lot of time by using frozen "soup vegetables" from the store. The soup vegetables taste great, they're already pre-cut and include lots of variety. I learned this trick from Jeff Novick's Fast Food DVD recipe for Longevity Soup. Sure came in handy this weekend! Frozen mixed vegetables are good, too. Fall season is soup season! We just had split pea soup! Thanks for that reminder. I hadn't thought of how easy it could be to make vegetable soup. Will buy some frozen soup vegetables on my next trip to grocery store. Yes its soup time.. Looks yummy. Looks delicious, and perfect for cooler temps! Enjoy!